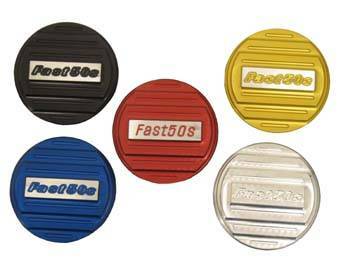 - Factory Fast50s logo visibly machine etched in the billet, high grade aircraft aluminum material. Choose from Red, Blue, Gold, Silver, or Black. Get your motor looking FACTORY with this affordable Cam Cover quality upgrade! Machined with PRIDE! No minibike company offers the quality of Fast50s products. Nothing we manufacture is standard!